This is one incredible decal sheet. I saw it applied to the Minicraft 1/144 Orbiter at a recent event and was just stunned by the level of detail. No way would I EVER have the patience to sit down and do tile detail as has been provided by this sheet. 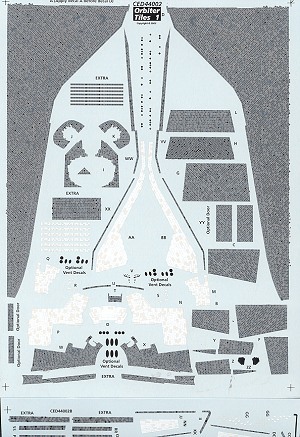 In fact, the sheet itself is huge, covering a full 8 1/2 x 11 sheet and two smaller ones. A superb decal placement guide is provided and there is an equally excellent set of instructions. As you can see by the small inset above, the level of detail is way beyond what most of us could possibly reproduce. This tile sheet is good for an Orbiter that is ready for launch. If doing one that has returned from space, you'll need to add some scorching on the sides and on the lower surfaces as a lot of this occurs upon reentry. 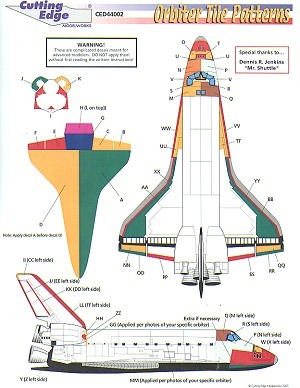 If you are going to do a shuttle kit and want it to look like one, then you really need to get this sheet.